How you can work the world on 10 Watts? The populated STM32 F4 discovery board, difficult build this one... take it out of the blister pack from Farnell behind and then by itself the VIA board with the TFT plugged in below... not not added the rotary controller, power headers or the RF yet. The three layer 'sandwich' of boards. I will add some stand offs to hold the TFT away from the STM32 board, but case mounting should sort all that out. I'll upload a photo... just put fishing touches to a nice 7el Yagi.... so I can work that DX. OK should say 5el + driven and reflector I suppose. Inspired by W1REX in case others note the pedigree. It is a dummy load :-) with a bit of fun added in. Measures 49.83 ohms. 5W max. The beam is 6 1W resistors in series to make up the load, the rest of the beam is thick insulated copper wire. Hacked a length off a reel that does conduit mains feeds. The tin, sprayed with paint was what remains after lunch yesterday, shared with the cat... finest tuna. The tower and the lid are off cuts of FR4. An RF probe circuit exists below and if you feed in RF you can measure the voltage on two leads i have poking out of the lid to one side of the tower. I MIGHT for fun include an IM3914 and bar graph LED. Will never be without a decent antenna at that next dummy load operating session. Yes I had thought it might be fun to actually make this for 23cm/1296MHz so it worked for real, feed it with RG316, to measured copper tubing.... maybe next time, will be a tad larger though! The internet is brilliant if you want to have a go at building along with others even a couple thousand miles away. So having already had fun with the SDR2GO and the STM32SDR and softrocks I decided to have a go at the Vector Impedance Analyzer (VIA) which uses one of the STM32 development boards, a TFT touch display and some controllers. I have just finished populating the VIA PCB and adding the headers for the 3 board 'stack' of the TFT, VIA PCB and STM32 dev board. Got to add some headers for the rotary controllers and then will box it all up. I will probably use a dicast box but might make one from FR4. 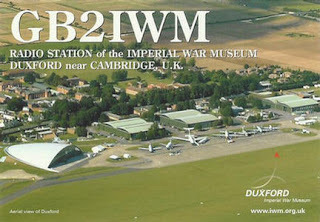 Hope to get this done by the next Camb-Hams pye and pint in the White Horse, Barton next Wednesday 6th April. Board with the difficult CODEC and other SMT already attached. I have a couple of torrid transformers with some big 6A 9V AC windings. I want them as 3A 13.8V static supplies. I had thought about rewinding the secondaries but the simplest (read cheapest) option looks like something from eBay. Input Current: 16A (MAX), if the current is larger than 8A, please add extra heat dissipation. 1, DIY a regulated power supply, input 12V can the output can 12-46V/60V adjustable. 2, the power supply for your electronic equipment, can set according to your system voltage output value. 3, as the vehicle power supply for your laptop, PDA or digital products supply. I expect I will have to add some filtering to the output as this will create some hash (quick test shows it does) but nicely RadComic a few months back showed some simple common mode filters that will do the job. I have a load of sub 1MHz ferrites just begging to be pushed into service. The pcb even has the cable points for a fan so might dig out an old CPU heatsink fan and add that. mains in visa a kettle lead type socket, dpdt switch and fuse, into the transformer, 6A 9V AC out into a bridge rectifier, 10000uF capacitor 16V across the output, into this module, via a common mode filter, out of this module into a second common mode filter then DC output.10000uF capacitor 16V across the output. I MIGHT put a voltage display on the in and the out. I will test to see if need to use a voltage regulator, if I do will be an LM317 and pass transistor. I'll post some pictures soon but at w/e went around a car boot as Christine wanted to look at the stalls. I found one of those stalls selling hardware, always wanted to try it and they had boxes at £1 each so picked up eight 5m rulers. I will fashion a small square or ring that the rulers can attach to and you can then lay them out under a fishing pole vertical. 5m so just 15m up. The 10m ones (they had them) were £4.50 each which was a tad too much else I could see a 40m vertical happening! And a GQRP member recently had some fun with the display on his build of the Sweeperino http://hfsignals.blogspot.co.uk/p/sweeperino.html. As I had already built this one myself a while back (I had a number of spare AD8307 and a power meter PCB after kitting the PHSNA project). I used an Uno rather than a nano Arduino but other than that just the same. 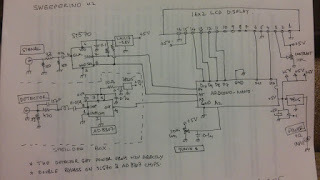 Just to confirm the project schematic and wiring is correct I thought I'd rebuild it (schematic does say V2) breadboard style. Sadly I never kept my original notes etc as I lent, now appears 'gave' the project to an M6 who seems to have given up radio and evaporated. so I thought I would check this out first with a simple "hello world" type program, that also showed the elapsed time since the Arduino was restarted on the line below. One of the first thing the project does on startup is to check that either an Si570 or Si5351 is present. The pages do not say you need to go get both the Si570 and Si5351 libraries, but if you do not it complains on compile and fails. So fix that. Anyway if neither is present it tells you, anyway mine worked fine. You need to calibrate the power meter and the AD8307 will be linear from about 1MHz to well over 150MHz so you will want to callibrate it. 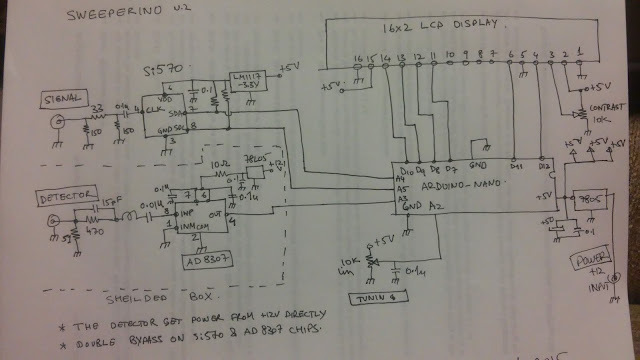 I used a couple of simple canned CMOS oscillators 10MHz, 24MHz and 64MHz to create a callibration plot. This is for MY Power meter only, build another and this probably will change so I will not reproduce it here. See http://w7zoi.net/pmtr-build.html for how a power meter can look, does not have to be neat! The software to be loaded into Sweeperino. Download it from https://github.com/afarhan/sweeperino. The unit can be used stand alone or you can also use it with some spectrum scope software and scan the frequency and measure the feedback. download the source code or the exe from https://github.com/afarhan/specan-ui but see Farhan's page http://hfsignals.blogspot.co.uk/p/sweeperino.html about how to use it. Well this was a fiasco... cards came back wrong... was my fault. Anyway I will print them myself and send these out asap to those that have requested them. Just ordered some 240gm paper for the photo printer. 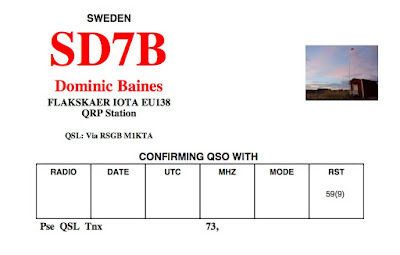 The QSL card will be pretty simple but will qualify for IOTA. Apply 230VAC to the black/white primary and obtained 15.05VAC on the secondary. Pass the secondary voltage through a simple heat sinked square block 100A rated bridge rectifier and 35000uF smoothing capacitor across the output and obtained just a little over 13.13V DC with very little ripple. I will provide oscilloscope images later. The transformer did not get hot to the touch even after about 2 hours providing 12VDC (rectified) at 26 amps using a bank of 12V 50W spots as a load. The current was measured at several points during the test. The 240AC feed was fused at 5 amps however, the current used was not measured. As I have several identical 430-7103 units, I paired two up, so fed the primaries in parallel and the secondaries in series and no surprise 26.37V DC obtained using the same setup. I believe these would make ideal 12V supplies or lower voltage variable bench supplies. Wire as a pair (which is how they are used in the APC UPS originally) they should easily provide the voltage headroom required for suitable regulation circuits and would easily provide voltages between 0 and 24V. Heatsinks will be required at higher current that might general heat. A voltage above 12V could be obtained using a buck boost DC-DC module rated appropriately with a single transformer. I am sure the current handling capability of these will be well in excess of need. I also have a couple of torroid transformers (do not look like they came from APC though, seemed to be using split primaries, expecting 110VAC on each winding, can connect in series to use with 230VAC and twin outputs (that appear to be identical). The output (two of them) were just over 28VAC, DC 24.85V and each managed >6A and >11A when connected in parellel. Important note: I post this here so that the information is shared with others. It is not mine and I do not claim any ownership of it and share this so that others might benefit from it. The issue is one where with an upgrade in wspr spots appeared to be being lost. "...no particular difficulties with earlier versions of WSPR and older 32-bit computers. Now I am running it on a 64-bit machine and there are slightly random problems of uploading spots. I see from the WSPR pages and various blogs that several people have these issues. My difficulty is that, apart from finding no ready-made answers, I cannot find any good write-up or even find any account of which of the myriad files might do what...."
This was how it was 'fixed'. http://www.george-smart.co.uk/w/index.php?title=Compiling_WSPR&oldid=5027 I am using Linux Mint-17 and have no direct experience of running WSPR under Windows. WSPR-4 is a bit flaky, particularly in uploading to the database and maps, in both Linux and Windows. There is a newer version, WSPR-X, and this appears to be even more flaky according to various forums. Spots are held in file ALL_WSPR.TXT. This file is a complete log of all WSPR activity rx and tx. They are uploaded to the WSPR database. Confusingly there are references to the “old database interface” although this is the working interface. 1. In real time: check “Upload spots” box in WSPR gui; starts from the time when the box is checked. Sometimes data is not shown in interface, but it is always registered. 2. To upload all new spots manually. Open site http://wsprnet.org; click on “Database” in top right-hand corner; scroll to bottom of Database; click on Link to old database interface. Enter callsign and Maidenhead locator. In the box labelled “Location of ALL_MEPT.TXT” enter the location of ALL_WSPR.TXT. Then click on “Upload spots”. 3. To upload all new spots automatically. 1. Obtain a copy of curl. In linux : sudo apt-get install curl . This is a general program for transferring data to/from a server, with a huge number of options. Desktop/ALL_WSPR.TXT is the location of ALL_WSPR.TXT, callsign and Maidenhead locator are obvious, allmept is the receiving file at the wsprnet target. The rest of the mumbo-jumbo are curl options. 3. Under Windows the procedure is similar. 4. See attached for my Linux script and the Windows option of N8FQ, taken from the WSPR site. 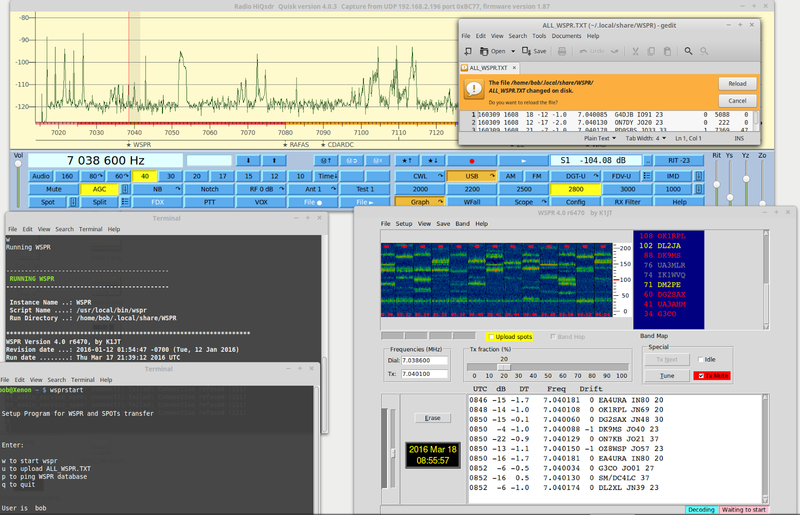 Also screenshot of operation using HiQSDR + Quisk software. printf "\n\n Setup Program for WSPR and SPOTs transfer \n\n"
printf "\n \n Enter: \n\n w to start wspr \n u to upload ALL_WSPR.TXT \n p to ping WSPR database\n q to quit \n\n"
printf "\n User is "
printf "\n Pinging WSPR site \n\n"
printf "\n Leaving setup routine \n \n"
The ping command is used as a delay of approximately 4 minutes. I have been given 4 transformers that came from two old APC units that were replaced. Transformers are fine but trying to find out details about them... marked 430-7103 Class 180(H) they are pretty big beasts (about 12cm x12cm x10cm cubes). Windings are one side single black and white 10AWG other 4 wire (two pairs) 16 AWG. Seem on test to be fine but looking for some info. Can you advise? ..."
So I expected some help as I am clearly trying to make use of an old product instead of filling landfill. I know the original UPS had already gone through 5 sets of batteries and really were no longer fit for purpose anyway. Good day. May we ask what exactly do you need? I will check all this information and advise on your reply. but will if I absolutely have to. a couple of RBC7 batteries think you call it RBC11 when as one unit. Please I hope this is this enough information? ..."
I called up the source and asked for a serial number as seemed the 'support system' could not even do anything without it! To be honest. We do not provide those information from our end. This are internal information and due to proprietary reasons, we do not provide it to our customers. We also do not recommend opening and replacing/repairing internal components on our products. I'm afraid that we will not be able to provide those information. And if the UPS's are faulty, we do not recommend repairing it. What we usually do from our end is we replace the whole UPS (In-case in warranty) if there are internal component faults. Our UPS comes with 2-year standard warranty. So not only will they NOT help they even suggest throw the old one away and buy a new one when I clearly stated I did not have the whole UPS just the old transformers! The UPS was as mentioned decommissioned (dated 2003!) and taken apart and these are being re-purposed rather than sending as one lump into a landfill, so it would not have been a candidate for a 'repair' anyway. You company has a daffy policy if you are hiding behind it. Perhaps APC should consider helping this effort and not standing behind some crazy non-environmentally friendly policy, so I'll proceed without any assistance. I will not be inclined to recommend an APC UPS is used again. Hope someone finds this of some use I certainly didn't and I am stunned by their attitude. I will post details of the transformers on here once I have finished testing them. Primary (dual windings) blue/yellow and black/white the two pairs of windings. Secondary thick black and white. On the train yesterday I was asked by another passenger and his colleague what all the radio magazines I had (SPRAT and QQ) were all about. (Basically could they borrow one to read as they didn't have anything with them…not going to say no am I? ), anyway after 20 minutes or so after thumbing through the latest editions of SPRAT and QQ I was asked if I could explain some more about QRP and who can you speak to with just 10 watts? That is what the magazine said wasn't it? They admitted they used to both be in the Army (city now) but didn't know much about what signals did, it just worked as far as they were concerned. Interestingly they mentioned that they knew their new laptop used 70 Watts. Fortunately it was not one of the quiet coaches and noone else was in earshot at the time and I happened to have my own laptop with a recording of some sessions in it both me as the DX (SD7B & C5/M1KTA) the later from both sides and as the DXer (TX6G and E30FB, they knew where the Australes and Eritrea were. I did not manage a qso with E3 sadly but I recorded it all the same). (I like to listen to see who I missed or how I could have done it better next time.) So I replayed some of them. What was interesting is that they immediately picked up the differences in the perceived 'loudness' of some stations and how the signals seemed to change between them, and noise. Some needing repeats some not, they said they remember having to do that operationally. I didn't mention they were probably using some spread spectrum frequency hopping set up with a battle field uwave satellite link etc that would have been too much info. I pointed out that in my case I was only running between 8W and 10 watts (SSB recordings), several of the stations they could hear were running 400W, some 1KW but most about 100W, they could pick up those I expected were qrp and they could immediately tell the differences. The same in the case of the DX stations we knew were running 400W and the stations we could hear working them. We scribbled out a sort of world great circle and plotted where the different stations that could be heard were. They say this hobby is all about self-learning well I thought I learnt a lot myself too as I was explaining this. Where in the world can you reach with 10 watts. quite a difficult question to answer because of the number of variables involved. Ours is a branch of amateur radio (QRP) that has a passionate and devoted following. QRP stands for “Low Power” as far as most of us are concerned however as I am sure we know really QRP stands for “please reduce power” or “ I am reducing power”. Within QRP circles operators attempt to communicate using the least power possible and there are IMHO a very brave group that seem to always try to do this with less that 100mW. single side band (ssb) or amplitude modulations (am) or frequency modulation (fm) ie. Speech 10 Watts. carrier wave (cw) Morse code 5 Watts. Any more and it is considered high power or QRO. Now there used to be a power definition in amateur radio that it was not the radiated power but the input power, watts being volts times amps that was used to indicate how much power an operator was using. By that calculation that would mean one of my KX3 output signals at 10W ssb whilst using 13.8V and 2 amps actually meant I was using an input power of 27.6 watts! Seems I might have been a QRO operator all along! There are very definite differences in antenna radiation power gain levels as well so lets assume we are referring to the power level at the output of the transmitter and not using an erp calculation either. Anyway from my own experience you can certainly communicate with another operator, we would normally say work another operator in Australia on less than 5 Watts when using cw and under favourable conditions (propagation, antenna, patience, skill, THEIR antennas etc) you can work Australia with 10 Watts ssb. As we know a large part of successful operating is to ensure that your station is operating correctly. Under QRP conditions you want to be certain that your antenna is working efficiently and that as much as possible of your 10 Watts of RF is being radiated. So what do S points really mean to the operator? I am sure we have all practiced, listened to and worked weak stations. For reliable communications anything above S5 is readable. As we know S3 and S4 signals are workable but with some difficulty. S-meter should show an increase (decrease) of one S-point. So lets take an example received signal strength of S4 as the lowest, workable signal level, without being truly difficult, and equate that to a power output of 1 Watt at the distant, transmitting station then we can draw up a simple, albeit rough, table as follows. We know that S-units are logarithmic and the ability of the human ear to discern level changes is more logarithmic than linear. Then what this crude table might indicate is that if the distant station reduces its power from 1012 Watts to 64 Watts (For simplicity let’s call this a 1KW stations reducing to 60watts) or from, say, 100 Watts to 6 Watts, or from 10 Watts to 0.6 Watts etc. ,then the received signal that was say originally at S9 will drop only two S-points to S7. So, if you are receiving at S9 (extremely strong signals) you will start to receive signals at S7 (moderately strong signals) if the distant station reduces from 100 Watts to 6 Watts. Returning to the two guys on the train I remember they were able to pick out the differences easily without prompting. I find that this fact is often overlooked by lots of operators who run at power levels which are many times higher than they need to be for a successful, intelligible contact and always insist on using the linear. Sadly reality is it is never this simple. The above is theory, something I am not great on. However, experience says that it passes the test and can be a useful, empirical rule. We know this already even if we had not thought it out completely, we naturally raise or lower the volume of out voices when talking to others. It shows that pushing out lots of power is not necessarily the answer to long distance communications in every instance. I am positive any QRP fan does not need to be told that making a DX contact at QRP is so much more satisfying than a similar DX contact at higher power levels because you know your station is operating well. So hopefully this might help explain if you get asked how you can work the world on 10 Watts with a little bit of effort, some smarts and patience.